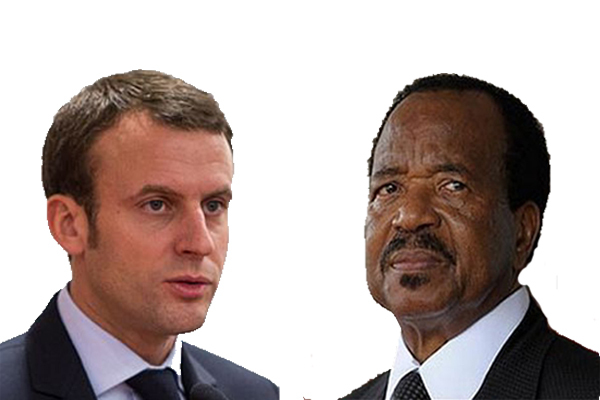 Macron Calls On Biya To Urgently Resolve The Crisis Between The Cameroons. It should be recalled that France is at the heart of the root cause of the crisis in Southern Cameroons. It advised Cameroun first President Ahidjo to collapse the first Federation and since then has tolerated Cameroun dictatorship. It is still to be seen how France is willing to help since Cameroun still remains one of its colonies in Africa, still pays colonial tax and the subjugation and assimilation of Southern Cameroons is a French policy designed to destroy the once former British Southern Cameroons. France has been accused to be one of the hands beyond Rwanda genocide and we can safely say that its hands can still be seen in French Cameroun Genocide in Ambazonia. Biya Paul, whom Cameroun constitutional Council declared the winner of the October, 9th 2018 Presidential elections has since come under renewed pressure from all diplomatic circles to end the war in Southern Cameroons and engage in dialogue. Biya is not capable of resolving anything, he is not a very smart man. He can continue to sign off all the resources of LRC Ambazonians are gone for good…..
Bareta News MUST subject itself to obtaining correct data on deaths, injured, maimed and burnt villages from the IG or Mr. Eric Tataw. You cannot continue to use grossly outdated estimates and numbers. This reflects poorly on the coordination of information and data exchange between groups. For your information, Cameroon Intelligence Reports last week stated a number of 4000+ dead “according to the IG” and a week later you are reporting 1000 less. WHY? WHY? With continued killing by LRC, these numbers change weekly. Please this is a very important piece of data and every effort should be made to be fairly accurate mindful of the fact that the number of deaths in the early part of this struggle are poorly accounted for.